Maggie Hardin, the director of business development and outreach for the art and design students at the New School, decides she wants to have a child and enlists a former college acquaintance, Guy Childers, a math major and pickle entrepreneur, to donate his sperm. At the university, she gets to know John Harding, a "ficto-critical anthropologist", who is married to a tenured professor at Columbia University. Repeatedly bumping into each other on campus, John confides in Maggie that he is writing a novel. Maggie begins reading it, and they start meeting on a regular basis to talk about the novel. Three years later Maggie and John are married, and they have a daughter, Lily. Maggie repeatedly finds herself having to put her professional goals on the back burner to take care of Lily and her two step-children and to support John's writing. Taking Lily for a walk she runs into Guy, who initially thinks Lily is his daughter but Maggie tells him that Lily is John's child. Maggie goes to see Georgette, John's ex-wife, at a book signing. She approaches Georgette and tells her that she knows Georgette is still in love with John and that she wants to help them get back together. Georgette decides to go along with the plan, and asks for Maggie's help getting John to attend a conference which she will also be attending. At the conference, Georgette and John make up and sleep together. Returning home, John confesses everything to Maggie who tells him he belongs with Georgette. John accidentally learns that Maggie had planned to reunite him with Georgette. He leaves Maggie and Lily and disappears for a while. Maggie goes to speak to Georgette in order to try to find out any news about John, and ends up taking Georgette and the children to her home, where Georgette spends the day reading John's novel. Meeting with him later she tells him her opinion about the novel. Realizing that she knows him better than he knows himself John forgives Georgette for her part in the scheme, and they reunite. Sometime later, the blended family goes out ice-skating. Maggie is surprised when Lily begins to recite numbers as neither she nor John are mathematically inclined. She sees Guy walking towards the ice rink. On January 9, 2014, it was announced that director Rebecca Miller and Greta Gerwig would reteam on rom-com Maggie's Plan to direct and star, respectively, scripted by Miller and based on the story by Karen Rinaldi. Rachael Horovitz was set to produce through Specialty Films along with Miller and Damon Cardasis through their Round Films. Julianne Moore was added to the cast of the film on January 15, 2014. Clive Owen had joined on May 1, 2014, although he did not appear in the finished film, while on February 2, 2015, Travis Fimmel joined the film's cast. On February 3, 2015, Variety reported that Ethan Hawke, Bill Hader, and Maya Rudolph had joined the film. Filming began on February 23, 2015 in New York City. The film had its world premiere at the 2015 Toronto International Film Festival during its 40th anniversary on September 12, 2015. Shortly after Sony Pictures Classics acquired distribution rights to the film. The film had its U.S premiere at the New York Film Festival on October 4, 2015. It also went on to screen at the Sundance Film Festival on January 22, 2016, and the 66th Berlin International Film Festival on February 15, 2016. After a New York invitation-only premiere on May 5, 2016, the film was released in the United States on May 20, 2016. 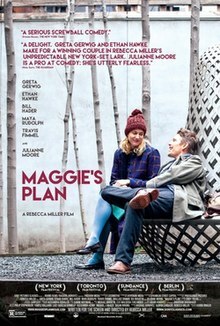 Maggie's Plan received positive reviews from film critics. It holds an 85% "Fresh" rating on review aggregator website Rotten Tomatoes, based on 153 reviews, with an average rating of 7.1/10. The site's consensus reads, "With a typically absorbing performance from Greta Gerwig leading the way, Maggie's Plan gives rom-com sensibilities a smart, subversive twist." On Metacritic, the film holds a rating of 76 out of 100, based on 35 critics, indicating "generally favorable reviews". Variety's Dennis Harvey describing it as "nicely crafted on all levels" with "Greta Gerwig, Ethan Hawke and Julianne Moore making a pleasing triangle in Rebecca Miller's offbeat romantic comedy". Richard Lawson from Vanity Fair praised the film as "A smart, goofy delight! ", highlighting Julianne Moore's "comedy chops" and praising the rest of the cast as being in "near-perfect harmony, creating a lively, inviting hum". Other critics also pointed out Julianne Moore's performance as "scene stealing", including Nigel M. Smith from The Guardian: "Maggie’s Plan serves as a strong reminder for what a comedic force Moore can be when served by the right material." He also singled out Gerwig for "effortlessly leading most of the picture". ^ "Maggie's Plan (12A)". British Board of Film Classification. April 13, 2016. Retrieved June 6, 2016. ^ "Maggie's Plan". The Numbers. Retrieved August 29, 2016. ^ a b "Emma Watson, Kate Winslet, and Many More Are Ready to Blow You Away at the Fall's Biggest Film Festival". Vanity Fair. Vanityfair. Retrieved 28 July 2015. ^ "Maggie's Plan". Comingsoon.net. Retrieved October 28, 2015. ^ a b Fleming Jr, Mike (January 9, 2014). "Rebecca Miller & Greta Gerwig Team For 'Maggie's Plan'". deadline.com. Retrieved February 23, 2015. ^ Fleming Jr, Mike (January 15, 2014). "Julianne Moore To Star With Greta Gerwig In Rebecca Miller-Helmed 'Maggie's Plan'". deadline.com. Retrieved February 23, 2015. ^ Kemp, Stuart (May 1, 2014). "Cannes: Clive Owen Joins Julianne Moore and Greta Gerwig in 'Maggie's Plan'". hollywoodreporter.com. Retrieved February 23, 2015. ^ Fleming Jr, Mike (February 2, 2015). "'Vikings' Star Travis Fimmel Joins 'Maggie's Plan'". deadline.com. Retrieved February 23, 2015. ^ a b Barraclough, Leo (February 3, 2015). "Berlin: Ethan Hawke, Bill Hader Join Rebecca Miller's 'Maggie's Plan'". variety.com. Retrieved February 23, 2015. ^ "On the Set for 2/23/15: Pirates of the Caribbean 5 & Snowden Begin Shooting, Joel Edgerton Wraps On Film for Blumhouse". ssninsider.com. February 23, 2015. Archived from the original on June 10, 2017. Retrieved February 23, 2015. ^ Setoodeh, Ramin (September 24, 2015). "Sony Pictures Classics Buys Toronto Comedy 'Maggie's Plan'". Variety.com. Retrieved September 24, 2015. ^ "SUNDANCE INSTITUTE COMPLETES FEATURE FILM LINEUP FOR 2016 SUNDANCE FILM FESTIVAL". sundance.org. December 7, 2015. Retrieved February 25, 2016. ^ "Maggie's Plan". Sundance.org. Retrieved February 25, 2016. ^ Sharf, Zack (December 17, 2015). "Greta Gerwig-Starring 'Maggie's Plan' Leads 2016 Berlin International Film Festival Panorama Lineup". Indiewire.com. Retrieved February 25, 2016. ^ "Maggie's Plan". Berlinale.de. Retrieved February 25, 2016. ^ Vilkomerson, Sara (February 24, 2016). "See the exclusive first trailer for Maggie's Plan". EntertainmentWeekly.com. Entertainment Weekly. Retrieved February 25, 2016. ^ "Maggie's Plan (2016)". RottenTomatoes.com. Retrieved January 29, 2017. ^ "Maggie's Plan". Metacritic. Retrieved December 14, 2016. ^ Harvey, Dennis (September 12, 2015). "Sundance Film Review: 'Maggie's Plan'". Variety.com. Retrieved February 25, 2016. ^ Lawson, Richard. "Julianne Moore Shows Off Her Delightful Comedy Chops in Maggie's Plan". Vanity Fair. Retrieved 2016-02-19. ^ Smith, Nigel M. (2015-09-13). "Maggie's Plan review: Julianne Moore steals agreeably messy comedy". The Guardian. ISSN 0261-3077. Retrieved 2016-02-19. This page was last edited on 8 August 2018, at 13:03 (UTC).